Tablighi Bishwa Ijtema, the second largest congregation of the Muslims after hajj, begins on Friday on the bank of the Turag River at Tongi. The first phase of the Ijtema will be held on January 11-13 while the second phase on January 18-20. Tabligh Jamaat is organizing the 48th Bishwa Ijtema, also called the ‘World Muslims’ Congregation’. The three-day congregation includes delivering bayans (sermons) on the fundamental issues of Tabligh, prayer for the spiritual adulation, exaltation and welfare of the Muslim Ummah. The first phase congregation will start formally with religious sermons after Maghrib prayers on Thursday and conclude with Akheri Munajat (final prayers) on Sunday. All preparations for smooth holding of the Ijtema have been almost completed with thousands of volunteers working round the clock to prepare the venue on 160 acres of land to accommodate the devotees. Multi-tier security measures have been taken in and around the venue to avert any unpleasant incident. Around 12,000 security personnel from different agencies will be posted to ensure smooth holding of the Ijtema. Observation towers have been set up to watch public movement while closed circuit televisions and video cameras installed at 18 entrances to the venue. Besides, helicopters, speedboats and pickup vans will keep on patrolling. Fire brigade cars and ambulances have been kept ready for any emergency. Over 25,000 devotees from over 100 countries, including China, USA, India, Pakistan, Malaysia, Japan, Singapore, Saudi Arabia, Kuwait and UK are expected to take part in the Ijtema. 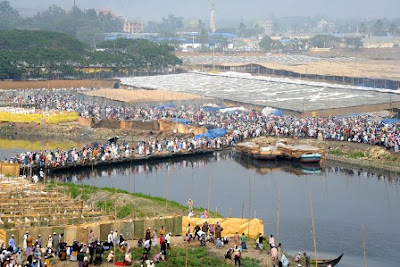 This year, Bangladesh Army has built eight floating pontoons to connect the Ijtema venue with the Turag River. Special measures have been taken to ensure uninterrupted supply of electricity during the three-day Ijtema. Apart from the existing 11 deep tube-wells, the Public Health Engineering Department and Army have taken separate measures to ensure uninterrupted water supply for the devotees. Some 2,834 toilets have been set up around the venue of Tongi Ijtema.